When I originally wrote this recipe, we had two toddlers and one baby. 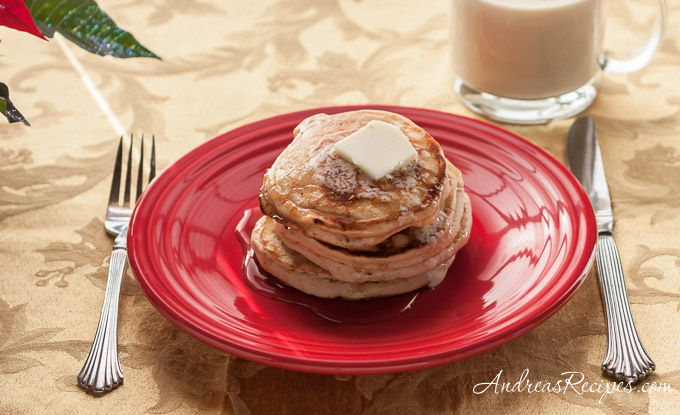 Now that the boys are growing up, we’ve found that we need a larger batch of pancakes for breakfast, so I’ve doubled the ingredients and added a little more eggnog to the original recipe to lighten the pancakes a bit. We think they are even better than before, and we hope you enjoy them as much as we do. Stir together flour, sugar, baking powder, salt, nutmeg, and cinnamon in mixing bowl. Add the eggnog, butter, and eggs. Stir until the dry ingredients are coated. Don’t over mix. Pour 1/4 to 1/3 cup of mix onto hot, greased griddle. Cook until the top starts to bubble and the sides start to firm. Flip and cook until lightly browned on the bottom.